At Fresenius Medical Care, our Registered Dietitians do more than simply educating patients on the dietary restrictions required to maintain a healthy lifestyle on dialysis. They go above and beyond the call of duty to bring an exceptional level of comfort to their patients, both during and outside of their time spent in the clinic for treatment. Finding personal fulfillment in their careers is what sets Fresenius Medical Care employees apart: we care about our patients, and we love what we do. Emily has served as the dietitian for Redbird Dialysis Center in Dallas, Texas for the past 5 years. Sometime last year, Emily started playing, "Happy Birthday" on the violin as the staff sang to patients. Emily says, "The patients really enjoy when I play "Happy Birthday" for them. The say things like, "it relaxes my anxiety," "it calmes my nerves," "it helps my blood pressure," and "it mellows me out." 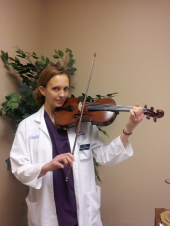 Emily went on to say, "I think the violin playing has helped me grow and connect with patients in many positive ways. I believe the violin music enhances the quality of life that Redbird clinic offers to patients and people who come inside the clinic doors. I come to work with a serving attidude and willing spirit as an employee of Fresenius Medical Care." 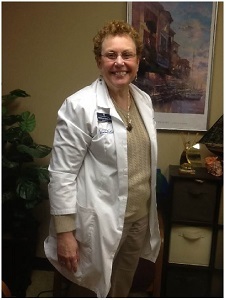 Barbara is the dietitian at the Fort Sanders Clinic in Knoxville, TN. The clinic is located near downtown and many of the patients have financial difficulties, including having enough money to purchase food. Barb has become active with the Empty Stocking Fund, a local effort to provide food to area people in need. This year, Barb has collected applications from her patients and will spend a full day delivering food to 27 Fresenius patients from several clinics. Barb does this on her own time and at her own expense. In addition, she is a great dietitian and servces as the RD Champion for the Smoky Mountian Area. Click here to find more resources for dietitians and information about how FMCNA and celebrity chef Aaron Mccargo, Jr. have come together to educate our dietitians and their patients about how to eat delicious, flavorful meals on a dialysis-friendly diet.